Need a beautiful soundfront property where you can escape with family or friends? You have found it at The Yellow Beach House in Duck, where the ocean is just a short walk away. Don't feel like walking? Then drive and use the community lot located at the oceanfront dune crossover. Feel like some quiet time, no problem, stay at home and relax on one of the many decks - read a book or just enjoy watching the birds ride the wind. Later on, enjoy a swim in the private pool. Or chill down some drinks and enjoy the poolside bar. In the mood for some fresh water adventures? The H2OBX water park is just over 12 miles away. 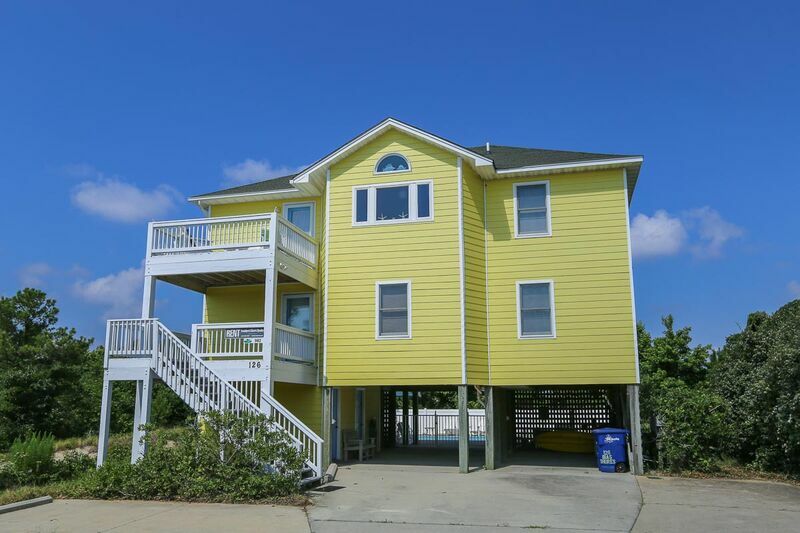 Perched on one of the highest dunes in Duck, this home has something for everyone to enjoy. Take a stroll down the bike path to downtown Duck. The Town of Duck offers morning Tai Chi and yoga on the village green as well as live concerts and other community events. All this in addition to the great range of restaurants and shopping. Enjoy your time creating memories for a lifetime as your cares melt away in the sun, sand and warmth of this peaceful property. 4 bedrooms (1 with Double, private bath and TV; 1 with 1 Bunk set and 1 Twin; 1 with Queen and TV; shared bath; 1 with Queen with bath). Den with TV, PlayStation 2. Laundry area. Enjoy wonderful views from the spacious front and back decks. Master bedroom (with Queen, large Jacuzzi tub and separate shower, TV/DVD, beautiful sound views). Huge vaulted great room with dining area to seat 10! Make a great family meal in the fully equipped kitchen, TV/DVD player/stereo, and powder room. Front and back decks. My family frequently visits OBX, usually renting oceanfront estates. We decided to go soundside this summer to mix it up. We loved everything about this house: the open floor plan, private rooms, gorgeous/private pool, sound/sunset views, multiple decks, access to the sound...the list could go on and on. We can't wait to visit the Yellow Beach House again and again! The whole fam was in agreement that this is our rental for years to come!